Christmas joy made easy, okay maybe that’s a stretch. 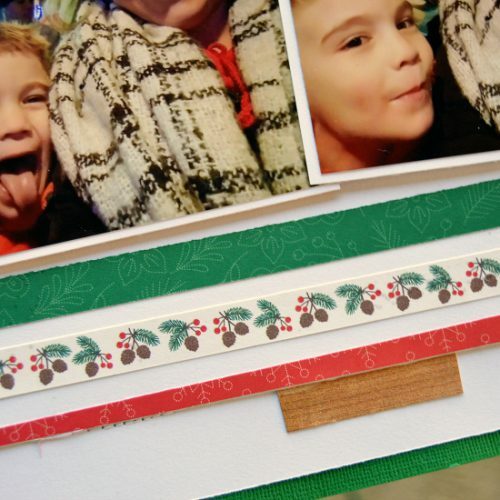 But capturing Christmas Joy was certainly made easier by the best adhesives around from Scrapbook Adhesives by 3L! 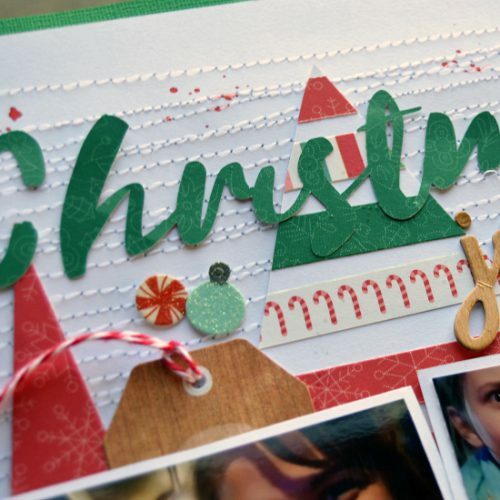 Christine joining you today with a Christmas Scrapbook Layout and one especially fabulous tip! This Christmas layout has lots of little details but there’s a couple I want to really focus on! First off, let’s talk about how amazing the E-Z Runner Grand Dot Permanent Refill is! A recent tip from team member, Margie, led me to try this refill for my cut-file title. I simply set the cut-file onto some scratch paper and rand my runner all over the backside of it. It picked up the dots and made it ready to adhere. Here’s a close-up look! I’ve used several adhesives on my cut-files before – the E-Z Runner with the Micro Refill, Adhesive Dots, and the Dual Tip Glue Pen. While all of those worked well and got the job done, I think the Dots Refill is the easiest and quickest! I’m not sure why I had never thought of it before – but it certainly will be a standard in my arsenal now! As I created this Christmas layout I cut out half-inch strips and laid them all across my cardstock. I did not aim to keep them straight – I just wanted a lot of wonky lines! I also didn’t know if I was going to cut out the tree and use it or use the negative space. Both ideas worked in my brain, but I need to get a visual! Because of that, and my uncertainty as to which direction I was going to go, I used the E-Z Runner Grand with the Dots Repositionable Refill to start. I then went back and secured them with the Dots Permanent Refill later! All of this will make a little more sense in my video! This entry was posted in Adhesive Dots & Lines, Adhesives, Crafts & Tutorials, E-Z Runner® Dispensers, E-Z Runner® Grand, Intermediate, Permanent Adhesive, Repositionable Adhesive, Scrapbook Page, Scrapbooking, Seasonal Craft Ideas, Skill Level, Tutorial, Winter and tagged 3D Foam Circles White Mix, Christine Meyer, E-Z Dots Permanent, E-Z Dots Permanent Refill, E-Z Dots Permanent Refillable, E-Z Runner Grand Permanent Dots Refill, E-Z Runner Grand Repositionable Dots Refill, Scrapbook Page, Scrapbooking, Video Tutorial. Bookmark the permalink. One Response to "Christmas Joy Made Easy"